An iRULU projector makes you feel like bringing back home a movie theater. Movies, matches, games, KTV, no matter what you want to play, iRULU projectors can give you an unexpected experience. With palm size and 100" giant 3D screens, iRULU projectors enable you high feel the excitement of the heavens at home, and feel the immersive thrill. LED has no radiation and protects your children's eyes. You can accompany kids to watch cartoons, and enjoy the fairy tales world with them, to create a happy childhood for them and have a pleasant parent-child time. It has increased interface of VGA and TV, multi device connectivity with a smaller volume and more powerful functions. With the correction design of back type vertical keystone, even if you are a novice, you can also adjust the projector by yourself and enjoy the giant screen time. AV\VGA\USB\SD\HDMI\TV slots which make it possible to connect desktop, notebook, tablet, DVD, WII, XBOX game machine, MP5, digital camera to this projector. Please note that the projector is NOT Recommended for PPT, Word, Excel or business presentation. We provide one year warranty for 100% customer satisfaction, as well as Customer Service & Technical Support. 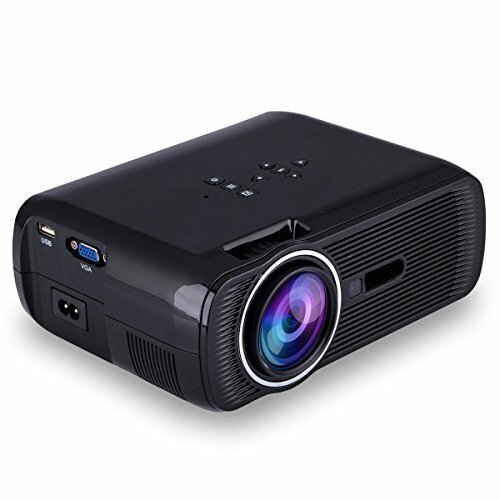 1. iRULU Multimedia Projector,800x480 pixels native resolution, compatible resolution up to 1080p, contrast 1000:1, supports manual correction ±15°. NOT Recommended for PPT, Word, Excel or business presentation. 2. Multimedia function with AV\ VGA\ USB\ SD\ HDMI\ TV input to getting your favorite programs with a big screen. Enjoy video movies by connecting the PC / Laptop/Phone/, enjoy games by connecting PS3 PS4 or X-Box360 via HDMI port. 3. Projection screen size: 37-130 inches, Projection distance: from 1 to 4 meters, focus the image by adjusting the gear on the projector, another gear is for adjusting the keystone, suggest best projection size 50-100 inches, best projection distance 1.5-3m. 4. Built in 3.5mm audio port to connect additional sound system, newest mode and system, provide solid clear image in dark environment, suggest the projector had a break after working 4-5 hours avoiding overheating, treating it good, will extend its working life. 5. Portable projector design:212*150*78mm, easy to take and travel, save much space in your room, ideal for home theater movies and music video games, display sweet memory pictures to family members. Supply 1 year warranty and customer service for your satisfaction. If you have any problem with the projector, please contact our customer service for troubleshooting.